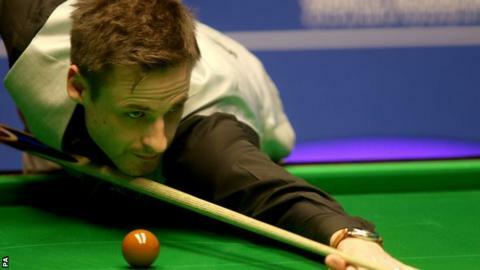 David Gilbert says he is already thinking about the new season after seeing his best ever campaign end with a battling first-round defeat by Ronnie O'Sullivan at the World Championship. World number 22 Gilbert said he played "probably the best I'll ever play and not win" in losing 10-7 to the five-time world champion at the Crucible. He was happy with a season that saw him reach his first ranking event final. "It's been my best financially and my ranking's never been so high," he said. The 34-year-old added: "I am looking forward to next season already." Gilbert, who reached the International Championship final in China in September, trailed 6-3 overnight but hit four breaks of more than 50 as he pushed O'Sullivan in a high-quality match. O'Sullivan refused to fulfil his post-match media duties and faces a fine. Gilbert felt he could hardly have done more in his first-round match. "It was an honour to play the legend that is Ronnie O'Sullivan," continued the Tamworth potter. "The guy is amazing. He wasn't quite on the top of this game, but his safety was brilliant. "I felt like I learned a lot from it. I have nothing to feel disgraced about. I gave it my all and it wasn't quite good enough. "I really enjoyed it out there. There's not a lot you can worry about when you're up against a player like Ronnie. You expect to get punished every time." Gilbert continued: "I just tried to attack. My game plan was that the only way I could win was to attack, attack, attack, so I pretty much went for everything. "His all-round play is just unbelievable. His tactical brain is brilliant. My safety and tactical play is nowhere near what Ronnie's is. He plays shots I don't even see. I have to improve in those areas."